This article examines the body of research investigating the impacts of the WebQuest instructional strategy on teaching and learning. The WebQuest instructional strategy is often praised as an inquiry-oriented activity, which effectively integrates technology into teaching and learning. The results of research suggest that while this strategy may have a positive impact on collaborative working skills and learner attitudes, there is little direct impact or advantage for increasing student achievement when compared with other instructional activities. Included in this article is a discussion of the notable research studies that have investigated the WebQuest strategy as well as a discussion of the implications and future direction for web-based inquiry projects. Abbitt, J. & Ophus, J. (2008). What We Know About the Impacts of WebQuests: A Review of Research. AACE Journal, 16 (4), 441-456. Chesapeake, VA: Association for the Advancement of Computing in Education (AACE). Retrieved April 21, 2019 from https://www.learntechlib.org/primary/p/26092/. Beyerbach, B., & Burrell, M. (2004, March). Preserviceteachers response to a Webquest oncul tural ly relevant teaching. Paper presented at the Society for Information Technology and Teacher Education In terna-Association for the Advancement of Computing In Education Journal, 16(4) t iona l Conference 2004 , A t lan ta , GA.
Burke, M., Guffey, S., Colter, S., & Riehl, J. (2003, July). B ioWebQues t: Evaluating the effectiveness of a "WebQuest" model of inquiry in a b i-o logy sequence for nonscience majors. Paper presented a t the Syllabus 2003 Conference, Palo Alto, CA. Carroll, V., Legg, R., & Taylor, D. (2003, October). Redesigning an undergraduate geography course a t Trinity College Dublin using WebQuests. Paper presented a t the World Conference on E-Learning inCorporate, Government, Healthcare, and Higher Education 2003 , Phoenix, AZ. Dodge, B. (2001). Focus: Five rules for writing a great WebQuest. Learning and Leading with Technology, 28(8), 6-9. Fox, L. (1999, October). Going on a WebQuest with "at risk" adult learners. Paper presented a t WEBNET 1999, Honolulu, HI. Gaskill, M., McNulty, A., & Brooks, D.W. (2006). Learning from WebQuests. Journal of Science Education& Technology, 15(2), 133-136. Gorrow, T., Bing, J., & Royer, R. (2004, March). Going in circles: The effects of a WebQuest on the achievement and attitudes of prospective teacher candidates in education foundations. Paper presented at the Society for Information Technology and Teacher Education In terna-t iona l Conference 2004, A t lan ta, GA.
Herron, M.D. (1971). The nature of scientific inquiry. School Review, 79(2), 171-212. Kanuka, H., Rourke, L., & Laflamme, E. (2007). The influence of instruc-t iona l methods on the quality of online discussion. British Journal of Educational Technology, 38(2), 260-271. Kortecamp, K., & Bartoshesky, A. (2003, March). WebQuest: An ins truc-t iona l tool that engages adult learners, promotes higher level thinking and deepens content knowledge. Paper presented at the Society for Information Technology and Teacher Education International Conference 2003 , Albuquerque, NM. Leahy, M., & Twomey, D. (2005). Using web design with preservice teachers as a means of creating a collaborative learning environment. Educational Media International, 42(2), 143-151. Maddux, C., & Cummings, R. (2004). Fad, fashion, and the weak role of theory and research in information technology in education. Journal of Technology and Teacher Education, 12(4), 511-533. Maddux, C.D., & Cummings, R. (2007). WebQuests: Are they develop-Association for the Advancement of Computing In Education Journal, 16(4) mentally appropriate? Educational Forum, 71(2) , 117-127. March, T. (2005). The new www: Whatever, whenever wherever. Educational Leadership, 63(4), 14-19. Milson, A.J. (2001, November). Engaging students in historical inquiry using internet resources. Paper presented at the Annual Meeting of the National Council for SocialS tud ies, Washington, DC. Milson, A.J. (2002). The internet and inquiry learning: Integrating medium and method in a sixth grade socials tud ies classroom. Theory and Research in Social Education, 30(3), 330-353. Molebash, P., Dodge, B., Bell, R., & Mason, C. (2002). Promoting student inquiry: WebQuests to web inquiry projects (WIPs). Paper presented at the Society for Information Technology and Teacher Education International Conference 2002 , Nashv i l le , TN. Murray, R. (2006). WebQuests celebrate 10 years: Have they delivered? Action Research Exchange, 5(1). Popham, A., & Wentworth, N. (2003). Train-the-trainer: Developing a Webquest workshop. Paper presented a t the Society for Information Technology and Teacher Education International Conference 2003 , Albuquerque, NM. Roblyer, M.D., & Knezek, G.A. (2003). New millennium research for educational technology: A call for a national research agenda. 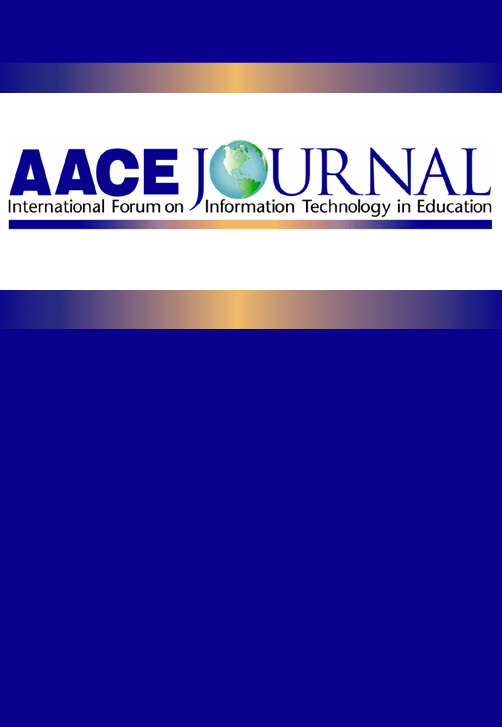 Journal of Research on Technology in Education, 36(1), 60-76. Santavenere, A. (2003). The effects of educational technology upon the critical thinking and analytical skills of be low grade-level and or nonco llege bound highschool students. Unpub l ished master's thesis, Salisbury University, Maryland. Strickland, J. (2005). Using WebQuests to teach content: Comparing in-s truc t iona l strategies. Contemporary Issues in Technology and Teacher Education, 5(2), 138-148. Strudler, N. (2003). Answering the call: A response to Roby ler and Knezek. Journal of Research on Technology in Education, 36 (1), 72-76.